Scotland could lose more than 220 GPs following Brexit, it has been warned. The Royal College of GPs is concerned that doctors from EU countries may not be allowed to stay in the UK. It has called on all political parties to guarantee the status of healthcare professionals from the EU who are already working here. The Scottish government said it was vital that GPs already in Scotland were protected, and that their successors could be attracted in future. The number of GPs in Scotland has dropped by 90 in the past four years and there are projections that by 2021 the country could need an additional 800. The Royal College of General Practitioners Scotland (RCGP) said that if 226 GPs from other EU countries working in Scotland had to leave following Brexit, it could have grave consequences for patient safety. Chairman Dr Miles Mack, whose practice is in Dingwall in the Highlands, said: "To learn that Scotland could face the loss of an additional 4% of its already stretched GP workforce is extremely worrying. "It is one in 25 of Scotland's GPs. It could negatively affect over 226,000 patients in Scotland. "We are calling for government to safeguard the GP workforce during international negotiations by guaranteeing the status of healthcare professionals already working in Scotland and the UK. "Last June's publication of the 2015 Primary Care Workforce Survey showed that numbers of Whole Time Equivalent GPs had already fallen by 90 since 2013 (around 2.4%, from 3,735 to 3,645). "We are now faced with a possible removal of a further 226 GPs who, as nationals of other EU member states, might be lost to the workforce if their status is not protected. "Again, we must call for immediate action to prevent that clear harm to the health service." He added: "Repeated surveys have shown the considerable percentage of GPs in Scotland who plan to soon leave the service as a result of overwork and consistent underfunding. 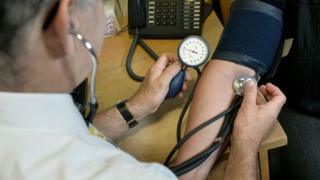 An enormous and urgent effort is required in Scotland to save general practice." Health Secretary Shona Robison said: "The uncertainty surrounding the UK's withdrawal from the EU presents us with many challenges for planning the future NHS and social care workforce. "The contribution of EU and EEA [European Economic Area] nationals to our NHS cannot be overestimated. Doctors, nurses and care workers from across Europe help to staff our GP surgeries, our hospitals and our care homes." UK Health Secretary Jeremy Hunt has previously paid tribute to "the fantastic work carried out by doctors trained overseas" in the NHS. Giving evidence to Westminster's health committee in January about the impact of Brexit, Mr Hunt said the prime minister had said one of the government's "top priorities, as part of the Brexit negotiations, is to secure their rights to continue to live and work in the UK". Scottish Labour said "the GP crisis began long before Brexit". The party's health spokesman Anas Sarwar said they would call for "a special arrangement for NHS staff so we can continue to attract health care professionals to come and work here and make Scotland their home". The Scottish Lib Dems said they supported RCGP Scotland's demands.